Our 10,000 square foot facility is located in Concord Massachusetts not far from many of the places you read about in your American History class. We have been in business for over 20 years and have about 30 employees. We have 100 computerized embroidery heads on our production floor. Out of the 8 machines 5 of them are 12-15 head monsters capable of producing a large number of the same design at one time. The remaining machines are smaller 1-2 head units that we use on low volume orders. machine can stitch 2 different items at the same time! 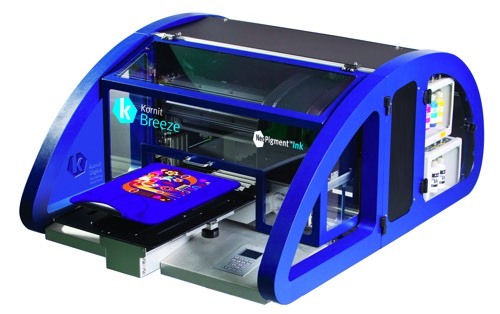 Another recent addition to our stable of equipment is a Kornit Breeze garment printer. This machine produces stunning printed apparel such as t-shirts, sweatshirts, and just about anything else you can think of. It does not need screens, squeegee's, of tubs of nasty ink. It prints similar to an ink jet printer directly on fabric. There is no limit to the designs that can be printed...that includes photographs! Having been in the business for over 20 years we have worked with just about every organization you can imagine. Most orders begin with a digitized logo stitched out on a sample of fabric (like the Marines logo below). Once approved the apparel that will be stitched in placed in a "hoop" and attached to a fixture in the embroidery machine. Hats use a special hoop that rotate the hat as it is stitched. Our shop wouldn't function without talented embroidery professionals. We are lucky to have one of the best working for us. Our Chief Digitizer Bill (who's hand is shown in the picture below) has been designing embroidered logo's since the days when they were plotted out by hand. These days his drawing board sits collecting dust while he works with state of the art digitizing software running on a high performance workstation. Keeping him company is Lucy, she makes sure that Bill gets all his work done on time so they can play ball after work. Like most embroidery shops we have our share of overstocked merchandise. We offer this merchandise on site at greatly reduced prices. If you are in the area and would like to purchase some brand name apparel at a great price, stop by out showroom and have a look.